I am a major fan of soup with noodles in it. Fujian hand pulled noodles with pork bones, Sichuan beef tendon and noodles, toothsome soba (all 3 noodle varieties will do! 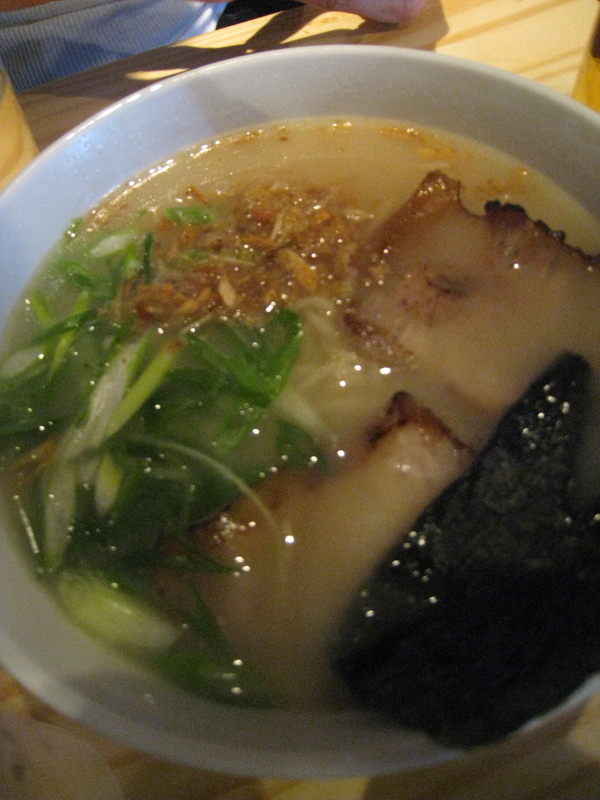 ), and of course the always satisfying bowl of Japanese ramen with roast pork slices. Every time a new ramen place emerges, I usually have my ear to the ground, listening for an opening date, and my eye on the prize. A bowl of ramen to me is like a banana split sundae to most normal human beings. I just adore ramen: the rich broth thickened by the starchy noodles, a nori sheet perched atop the noodles acting as a mighty sail as the bowl is navigated to the table, and the plethora of accompaniments such as fish cake, egg, and sprouts that all provide little nibbles of various textures and flavors. It’s a bowl of create-your-own-fun; a steaming bowl of facial worthy aromatics just for you. Last night I made my way to Totto Ramen with my friend Kenta, who is obviously more in the know than I am, considering I hadn’t yet heard of this new soup spot! We headed uptown and put in our names on an already growing wait list. Thank goodness there’s a lovely stoop next door that the neighbors didn’t really seem to mind us abusing for the short half hour wait. After a few names called, a few arigatos exchanged, we walked into the restaurant and instantly every sense was engaged. The show going on behind the counter provides eye entertainment, with two bandana’d young Japanese guys whipping up bowl after bowl of ramen (other food will be offered soon, promises the menu), the irasshaimase! shouted to welcome you to the restaurant definitely exercises the eardrum, and then the heady smell of the broth has your mouth watering before you’ve even sat at the table. 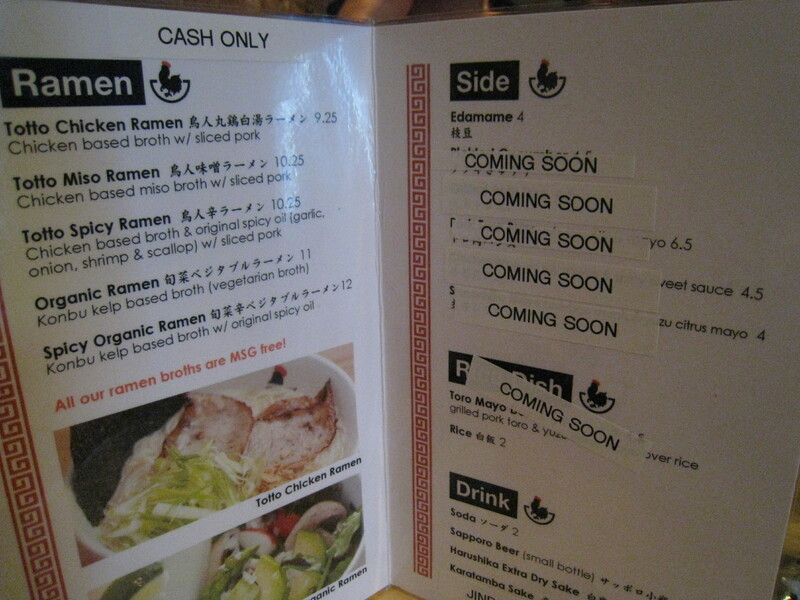 The menu is small, offering only 5 ramen options (2 of which are organic and vegetarian friendly) and a few drinks. Because of the limited choices, it made the deciding process that much easier….and ensures the food arrives only minutes after ordering. I ordered the spicy option, while Kenta had the chicken ramen. The price of a bowl of ramen at first glance is cheap compared with that of ramen rockstar Ippudo; but at Totto, there is a $1 charge for any extra toppings (no soft egg, no fish cake, no bean sprouts are included for your eating pleasure). The bowl of ramen could become quite an extravagant expense if you chose to include all those extras that you’ve come to know and love, and are *freely given to you at other ramen joints. But the first bite of ramen will make you forget the accoutrements. The broth is spicy and rich, silky and fatty. The noodles are served al dente. Upon first bite, I immediately thought of my chef at Del Posto and how he would approve of the perfect noodle cookery. The slick of chili oil laden over the noodles coats every bite, like a pauper wearing a fur coat. The noodles are elevated from a poor man’s food to something loftier: a prince could easily lose himself in these noodles and slurp his way into a tell-all tabloid, pictures of slurps and burps included. But then I tasted Kenta’s ramen, and was a little less impressed. Everything that had just raced through my mind, noting the lack of toppings but the impressive noodles, the richness and gloss of the broth, the sweet and salty slices of roasted pork… was all thrown into question when I tasted his bowl of soup. The noodles were more cooked than mine were (but maybe not everyone wants to eat Japanese noodles like an Italian…mama mia!, what can I say? ), and the broth definitely was lacking without the chili oil factor lubricating the whole kit and caboodle. My emotions were in swing, between loving my ramen and wistfully imagining a bowl of Ippudo’s miso ramen in front of Kenta (not for me to eat of course!…i was selflessly thinking of him..). 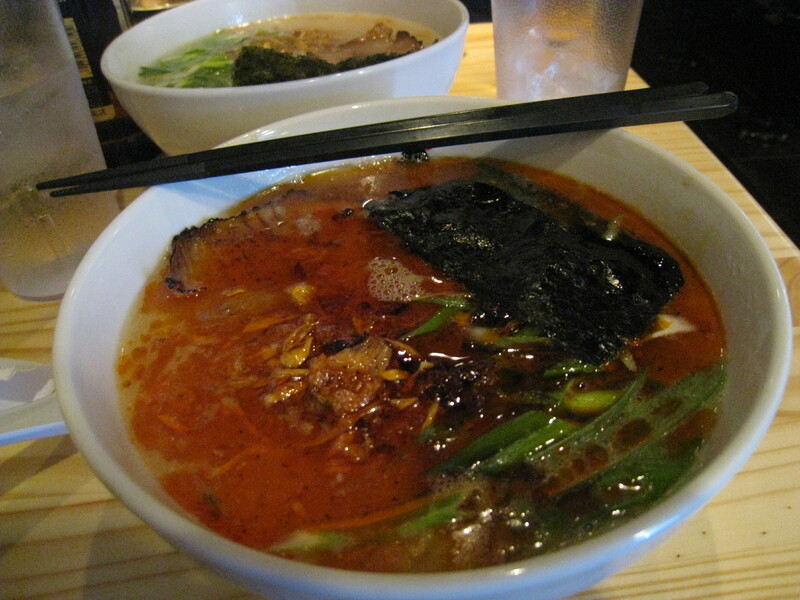 I concluded with the thought that the ramen is delicious and worth another venture, as long as it’s the spicy ramen! 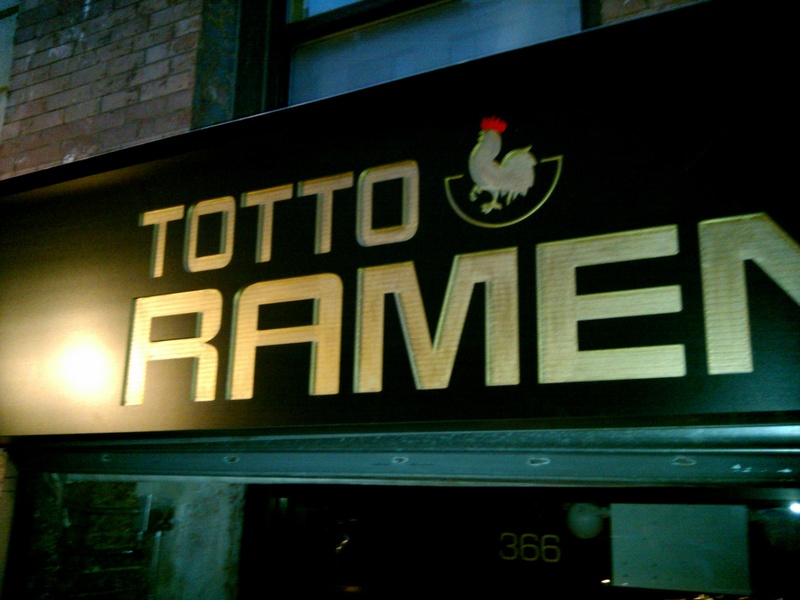 Totto is worth the trip uptown. Even if it’s to just sit at the bar and enjoy the sake and soup while watching the harmony of the cookers behind the counter. And I’m eager to go back once more food is added to the menu. Pork toro and yuzu over rice? I’ll wait in line for that! And because there’s no dessert on the menu, it’s a fine excuse to pop around the corner and finish out the Japanese meal with a little treat from Kyotofu. A fun Japanese filled evening you shall have. Thinking of someone else, you? Wow. How do I get on that list? I am glad to see your writing… Keep it up. When are you going to write again? Soon? All I want is a little more.